The Seniors at Prince Creek West area are still going strong since our clinic on September 8, 2011. Carol and Tom Gray have painted two courts in a parking lot and they play twice a week. I loaned them my paddles and net to get started and now they have ordered one net and four paddles. Carol and Tom are doing a fabulous job promoting Pickleball. Carol is becoming a member of USAPA. Seasons at Prince Creek West in Murrells Inlet, SC has been added to our places to play. The evening clinics at Crabtree on September 12th,16th and 26th went very well. I am very grateful to Rich and Diane Skrovan, Carol Gray and Pat Mills who came to help with those clinics. 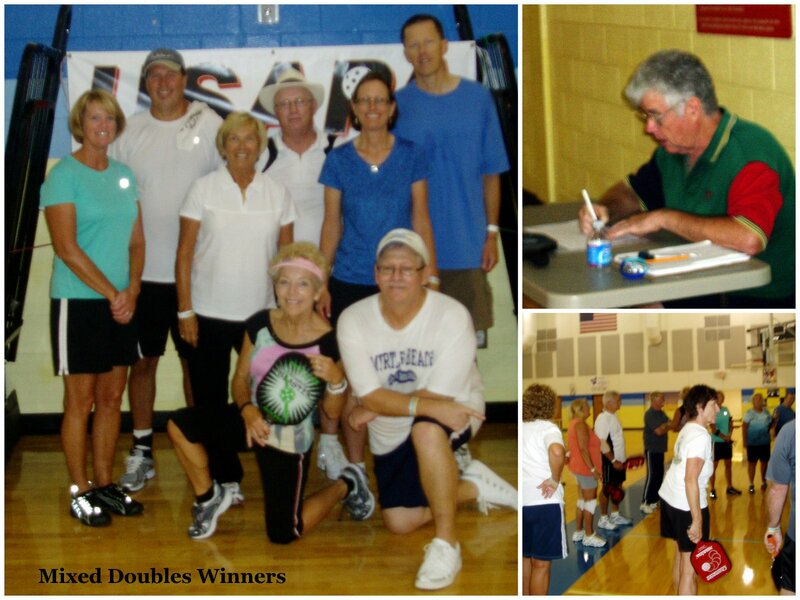 We picked up a few new members and lots of enthusiasm for the game of Pickleball. This is a photo from our first night. 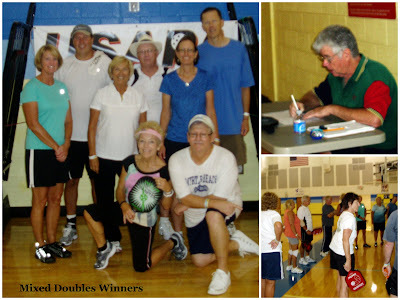 On September 16, 2011, North Myrtle Beach Pickleball players came to Crabtree Gym for a tournament and we had some real good matches and fun was had by all. A big thank you to Richard Brown for setting up the tournament. He did a great job. Thanks also to Fay Mills for planning the refreshments. Thanks to Diane and Rich Skrovan who were a big help and also took photos of the day and of the winners. All of our players from Crabtree prepared a nice lunch which everyone enjoyed. Thanks to all who took part in a truly fun day. The Conway Recreation Center opened on September 1, 2011. David Williams, whom I’ve been working with for some time to get his Pickleball program started, invited Rich Skrovan and I for a tour. “Wow” what a huge center. They have 2 full size basketball courts, a 1/10th mile track over that, an Olympic size swimming pool and every workout piece of equipment you would want. Although he has put 3 Pickleball courts in already, he is willing to put in as many as needed. He has room for 6. He ordered USAPA nets and paddles. Thank you to Rich and Diane Skrovan who helped me hold a clinic there on September 19th. We had 10 people attend. David is so eager to get Pickleball going that it makes me want to help him as much as I can. 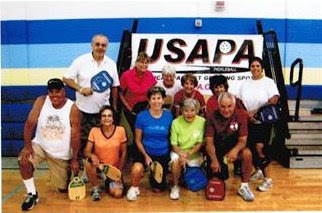 Right now Pickleball is played on Tuesdays, Thursdays and Fridays from 10am to Noon. If the interest is there the courts will be available 7 days a week. I will be going there on Fridays to teach newcomers till we find someone to take over. Although I will be driving 30 miles each way in order to help him, David is so eager to get Pickleball going that it makes me want to help him as much as I can. We have also added the Conway Recreation Center, in Conway, SC to our places to play too.